As an ethical business, part of our core responsibilities are aimed towards the way in which we conduct ourselves day to day and the processes, procedures and materials used in our daily operations. We have recently also adopted Geami WrapPak as an alternative to plastic bubble wrap. 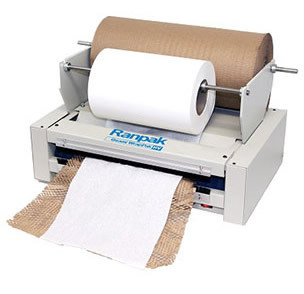 The Geami WrapPak uses a combination of die cut kraft paper with a tissue interleaf paper. The die cut paper is expanded into a 3D honeycomb structure creating a unique wrapping. No tape is needed at the ends of the product as the angled cells can be locked together. We want your order to reach you in one piece with no damages and provide training to our warehouse team to use the best packing techniques to protect your items whilst minimising packaging. We are constantly trying new techniques and types of packaging to be as environmentally friendly and efficient as possible. We are currently trialling paper tape and hope to move to this permanently in the near future. In addition to buying recycled and recyclable packaging, all of the excess day to day packaging used in our fulfilment centre is compacted, bailed and collected by a local recycling company. Our delivery notes included inside your parcel are printed on 100% recycled paper. In addition, the catalogues we print and send out on Spring and Autumn/Winter are printed on FSC certified paper from sustainable sourced using vegetable based inks and by a printer accredited with ISO14001 for environmental management. We offer a gift wrapping service and the gift wrap we have chosen to use is 100% recycled. Unfortunately we do find that products get damaged and sometimes we come across products with a short shelf life, in these cases we will always donate what we can to The People’s Kitchen, a charitable organisation providing meals and support to the homeless. We not only provide them with food but also much needed essentials such as nappies, toiletries and household products. Anything the People’s Kitchen does not need or can’t use is passed on to the West End Food bank in Newcastle. We support the West End Food Bank directly by offering customers the chance to donate to the organisation in the checkout area. Every year we run an alternative ‘Black Friday’ deal to support the food bank further, donating an item for every order placed with us. Anything that cannot be donated to the People’s Kitchen or West End Food Bank is offered to our staff to buy in order to raise money for our chosen charities. Find out more about our work with charities here. We are proud to announce that since October 2016, we are ZERO waste to landfill across our whole warehouse, office and kitchen waste facilities! See more about our Zero waste to landfill policy across the wider business here. This has continued into its second year and once again we sent zero waste to landfill in 2017. We have recycling bins in all offices around our premises to encourage everyone to separate recycling and make it a habit they can take carry on at home. We manage 170,000 sq. feet of warehouse space, which uses a considerable amount of power to operate, particularly during the darker months of Winter. In order to reduce our energy consumption wherever possible we look towards more innovative methods of lighting to save energy. In December 2011 we installed auto-switch lights in each warehouse aisle. This makes lights go on as movement is detected in the area and go out when there is none. As a result of this initiative alone we have reduced our consumption from 390Kwh to 294Kwh, saving 25%. To further reduce our energy consumption we are switching the whole business to LED lighting. Our contact centre has played its part in reducing the impact our business has on our planet by reducing our carbon footprint. All PC and printing equipment is shut down when not in use and we only have some of the contact centre lights on during daylight hours, which has reduced our energy consumption significantly. Simply by re-deploying the contact centre to an office with windows has massively impacted our energy consumption in a great way. In addition to the above, we 'Eco-check' any new process/procedure to reduce our carbon footprint and to date we have introduced Customer Service Solutions, which have reduced our paper consumption by over 20,000 sheets in the last 2 years which again has also added to reducing energy consumption. We constantly strive to adopt green policies across the business and in line with company policy, focus on and champion new initiatives. To encourage a healthier and more eco-friendly lifestyle we offer a cycle to work scheme to all employees, which allows them to save money when buying a bike and pay monthly out of their salary. We also encourage car sharing to work to reduce our carbon footprint. We use an eco-friendly Vektra kettle in our office kitchen to further reduce energy consumption.